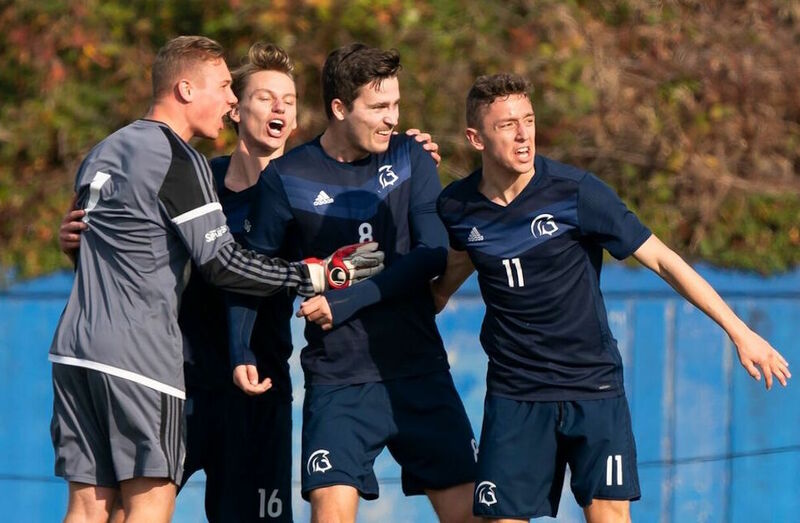 It took 120 minutes and penalties, but the Trinity Western Spartans claimed a 3-2 victory over the OUA Champion York Lions (0-1-0) on Thursday morning at Thunderbird Stadium. After York’s Maurizio Ragone and Cristian Cavallini, as well as the Spartans’ Leighton Johnson, all hit the crossbars during penalties, the Spartans’ Cody Fransen put a bullet past Lions keeper Mike Argyrides to finish off the upset. Johnson was the offensive catalyst for Trinity Western, as the fifth-year forward netted a goal and assist en route to Player of the Game honours for the Spartans, while freshman Noah Kroeker had Trinity Western’s other marker. 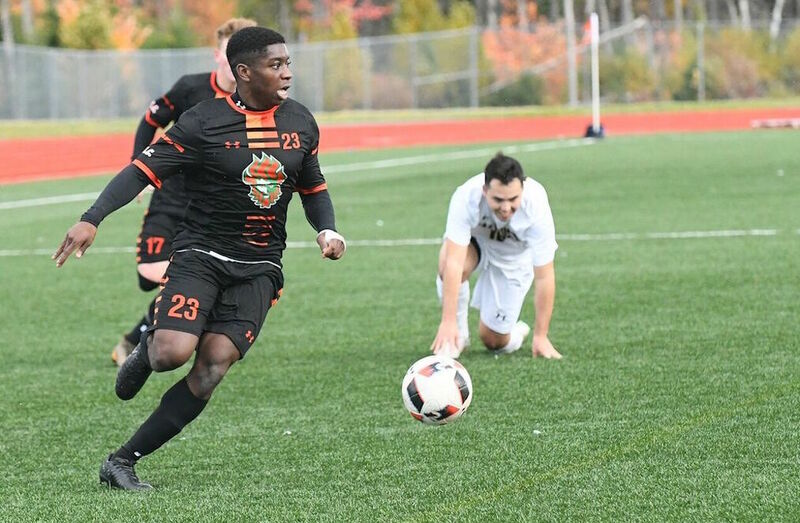 A brace from Cavallini provided the offence for the previously-undefeated Lions during regulation, as York battled back from a two-goal deficit while playing with 10 men for the majority of the second half. The best chance of the early going came off a corner 20 minutes in, as Spartans fourth-year Domenic Poletto blasted the ball from just outside the 18, narrowly missing the crossbar from distance. The Spartans were on the attack from the outset, taking every chance to make a run at the undefeated Lions. That aggression nearly paid off in the 27th minute, with midfielder Joel Waterman working firing an absolute strike from 20 yards out with only a diving stop from Argyrides holding the game scoreless. Going the other way, a full team breakout afforded the Lions their best chance of the opening stanza, as superstar sophomore Omar Marzouk capped it off with a run through the middle of the box, testing Spartans goalkeeper Sebastian Colyn from the left. Just before the break, a corner provided another prime opportunity for York to open the scoring, as Cavallini pounced on a loose ball in the scoring area and smashed a ball just over the crossbar from in tight. Another corner broke the deadlock nine minutes into the second frame, as Johnson’s wonder strike curled directly in from the left flank, climbing above both a crowded box and the outstretched arms of Argyrides. The Lions went down to 10 men less than two minutes later, when midfielder Steve Kloutsouniotis hung his leg on Poletto, leaving the Spartans forward on the pitch for a couple of minutes. In the 61st minute, Kroeker netted the Spartans’ second of the day, as the defender was on the receiving end of another well-placed corner from Johnson, then made no mistake in tucking the ball home. Just minutes later, Marzouk helped get the Lions back onto the contest, as his pace on a wonderful run forced Kroeker to pull him down in the scoring area. Cavallini netted the ensuing penalty without hesitation. Congratulations to the Players of the Games from the first @USPORTSca quarterfinal! Cavallini pulled the Lions all the way back after a long stretch of York possession, taking a long cross from midfielder Jorgo Nika and dropping a looping header in behind Colyn. Despite a flurry of chances over the regulation period’s final 18 minutes, neither side could break the 2-2 deadlock before the whistle. Trinity Western continued to dominate possession over the final 15, but the stout backline of the Lions prevented any high-end threats, as the two sides went to penalties. With the victory, Trinity Western will take the winner of the day’s second quarterfinal matchup between the UNB Reds and Montreal Carabins in Friday’s semifinals.